There is procrastination and procrastination. I mean I have thought about painting the walls in my office a beautiful forest green for weeks (and haven’t managed yet) but sometimes people put off really big things, things that matter. In the world of music there are bands who take their sweet time between album releases. For example Daft Punk took 12 years between “Human After All” and “Random Access Memories” and The Who went from 1982 to 2006 without a further album release in the middle. You have groups like this, then you get Geoff Lakeman. Geoff Lakeman is a surprisingly low-key figure in a flock of Lakemans, but there are few that will not recognise the name at all. Many are well known folk artists after all including Seth, Sam and Sean Lakeman, all artists very present and productive in their folk projects, but what of Geoff? Well if Lakemans are like springs of musical versatility then perhaps you could say that Geoff is the “limestone” that helped these waters emerge. As father to the others, he is the unsung song,the unseen wind that performed folk as a family for several years only taking it up full-time when retiring from a long, distinguished career in wall-street journalism. So when we think about time taken for artists to release work, few will match Geoff’s record of waiting until his 69th year to put his thoughts on to silver disc. But it is well worth the wait, our review of it is here and tonight he plays at Village Folk in Chellaston. Making his way in a rather quiet and unassuming manner, Geoff took the stage to show us what he knows. 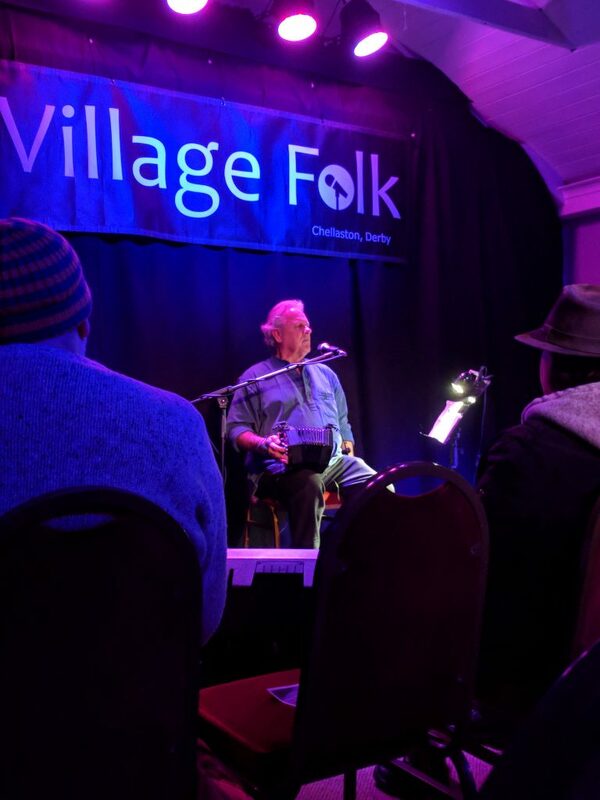 Perhaps this element of Geoff taking his time to make a disc from his 40 years of performance is what makes listening to Lakeman now a special and privileged event. It is a refreshing set. Lakeman skips across the Atlantic on more than one occassion bringing us “When the Taters are Dug” and “A Wide, Wide River to Cross.” The former being a delightful ditty about rural life from Maine, the latter is like a spiritual hymn with it’s powerful resonating introspection, the singer reaches far and wide in both location and tone. The crowd are rapt and attentive as he holds the stage for his own, it is a delight to see him touring. Delicate in character Geoff also sang “Someone waiting for me”, a track not found on “After All These Years” and when he comes back to our shores he storms in with an original number “Tie ‘Em Up”, based in history but eerily relevant to today’s issues to do with fishing quotas. Geoff also plays one of our personal favourites “Rule and Bant” about a couple of tin miners trapped in the ground following an accident in the 1800s. An emotional number, Geoff’s voice is quite elastic here portraying fear, good cheer and mystery. Politics gets as good as a visit as history too with Lakeman playing an excellent cover of “England Green, England Grey” by Reg Meuross instead swapping out the fine guitar work for his own concertina. As becomes apparent, the set has more than a few flashes of politics and history and has an awful lot to say much like the aforementioned Meuross who alongside Geoff are likewise chroniclers of our modern injustices. 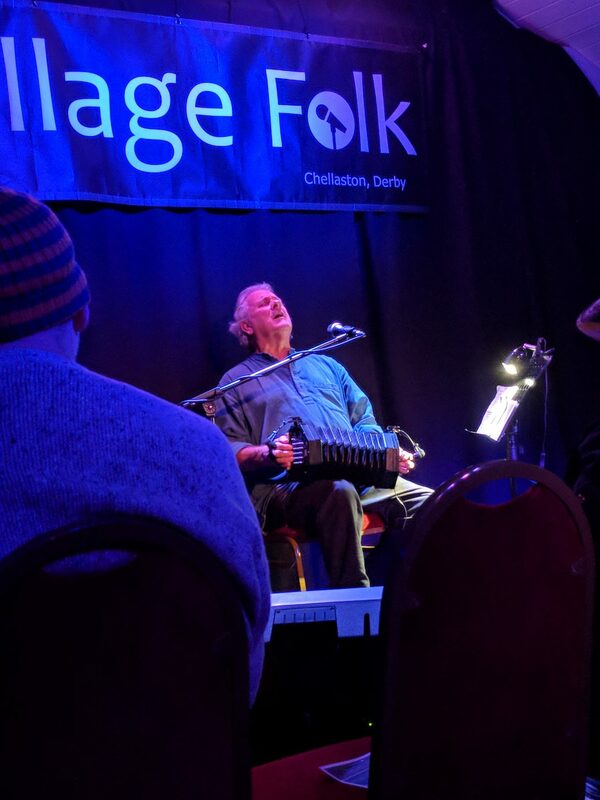 The joy of seeing Geoff is that he embodies the soul of folk music as he plays alone with a rare concertina quality with no production tricks, echos or otherwise. For many this alone is folk music at it’s purest, like col0ssal veins of iron before they are treated to become stainless steel. People who like their songs about the working man will not be disappointed here. In person and in performance there is isn’t a big band or a wall of sound but does not suffer for it. It is quite a pertinent observation as Lakeman jokingly tells the audience about the creation of the album. It is pretty entertaining to hear how it came to it’s current shape, especially at one point where Geoff sends a track off to Sean doing the production to add in another instrument and it comes back with more backing and Kathryn Roberts’ voice appearing on the number as a surprise. His laments about being coerced into including the track “Doggie Song”by said Roberts are also entertaining as he becomes concerned about being remembered for the guy who sings about “dog turds”. The risks of musical typecasting is certainly real! As well as showcasing a large amount of the album’s tracks, Geoff took some delightful sunny detours. He sings “The Seeds of Love”, that old, old classic collected from Cecil Sharp and a jaunty, folky version of Ella Fitzgerald’s “Making Whoopee” that makes really does the earth move. These little moments of sweetness and humour really bring a roundedness to the set elevating it above the preconceptions that some might have about folk music, e.g. that it’s all about death and seriousness. So in a strong, simple performance whose strength is it’s simplicity and clarity, Lakeman shows us he is an entralling, generous and accomplished host. The set brims with stories, the room sways and sings along in time and the night is awash with a quiet energy that fills the corners of the Lawns Hotel. A great night, a thorough, committed performance and as always a gracious, attentive and warm reception by this night’s organisers, definitely give one of Geoff’s gigs a go. Check out Geoff’s website for more information about where he is touring here! Hebden Folk and Roots Festival 2018-11th, 12th, 13th May. 5 Reasons Why You Should Go!